DALLAS - Soccer fan Randall Williams stated that he was most concerned with his prized collection of StubHub soccer ticket receipts as he finally works on the migration of his email off Hotmail to Gmail, on Thursday. Oh! the memories are flooding back of .... um.. wait... I need to view and print... ok, why is this having an issue. Dammit, ok,... it opened in a new window? Or, maybe my adblockier? It's gotta be my ad-blocker, except it worked last week. No, look it is still on my phone from the last time I forwarded it except fo.... oh wait, look it's a text from Donald. Hey DON! HOWS IT GOING BUDDY WINKYEMOTICON. Nice... ok, back to the tickets... yeah, memories... man. "Look, this is my ticket for USA v Trinidad," stated Williams to The Nutmeg News after fumbling around for 5 minutes trying to get the search function to work. "Here's my ticket for MLS Cup 2018 and 2016 and 2015. I tried to figure out how to get Michael Bradley to sign my electronic ticket receipt, but I couldn't seem to get Adobe Acrobat to work fast enough to allow Michael to create an electronic signature so that I could paste it into the ticket." Williams collection of tickets spans to a pre-electronic age when he created shadowboxes to mount his ticket stubs from his tour across America of professional baseball stadiums. "With soccer it's mostly done online, these days," stated Williams. 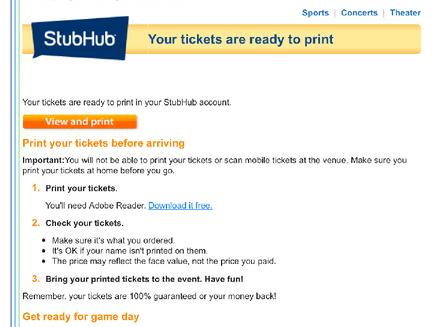 "I just gotta keep the memories alive with my StubHub receipts. Hopefully I can figure out a digital way to mount these so I can see them and not keep finding them in my search when I'm trying to find a new ticket for a new game." The Nutmeg News will have more on this as Williams inadvertently designates all StubHub related email as spam that should be deleted.